The ticket menu (available on mouse rollover) offers extra options, like changing ticket color, cloning or moving it to another project. Want to save some space in Board View? Simply fold the columns you do not need right now to hide its tickets. Get regular emails with the list of all your tickets that are due on that day (or overdue) using our Deadlines Auto-reminder. 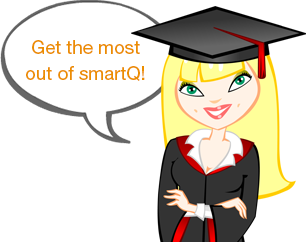 When you are replying to a smartQ email notification your message is automatically added into smartQ as a message in the respective ticket [read more]. 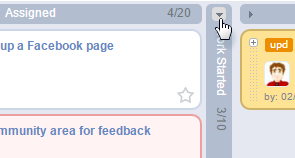 By default, tickets that end up in the last column of your board are auto-archived after a week. You can always change or turn off this feature via "options" menu. right click on the table column header. Even custom fields can be added as columns. use the dropdown menu on the search box. You can even search by text custom fields and ticket ID. if you set its sharing level to "Let people view without signing in". open the Ticket View and check the "history" button on the top — it shows who created it, moved it and so on. Use the F11 button to switch your web browser into full screen mode. by clicking on the "selected: X" link on the bottom left of the team selector popup. Did somebody try to login into my smartQ account? To monitor suspicious activity, like logins or login attempts from unknown locations, use Advanced Access Management and Logging. use List View — there is a switch there to the Archive. use the Report export to CSV/Excel. use button next to the tags filter dropdown. use User Logs or Administrator Logs. use Automation to create this and other rules. use multi-edit in List View or Dashboard. without adding all users to the teams, simply edit the "Everybody Else" in Project Settings / Project Team — it sets the default access level for everybody not listed in other teams. simply turn them off via Options/View settings. 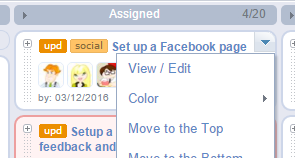 use the "Custom fields" button (the one with the "eye" icon) on the top of the board. (from example, one taken with Print Screen button on PC) simply use CTRL+V (Command+V on a Mac) when creating or editing a Note. You can also paste images directly into Board View to create tickets with image covers. use 8am + smartQ integration. simply add the tag name after the ticket name, with a "#" symbol in front of it (example: "Blog update #social"). use the "Options" screen to turn those checkboxes on by default for Ticket or Note forms (Admin access required). go to Options/Main Settings (Admin access required). use Advanced Access Management and Logging.